Welcome to another investigative report on… devices to control cameras. My readers will already know about intervalometers. No? Ok, you can read about them in this moldy old article. 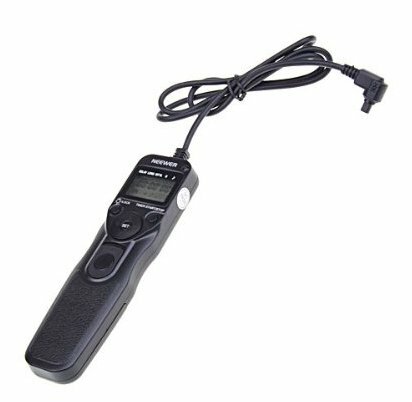 Reduced to its simplest form, an intervalometer is a device that electronically presses your shutter button and releases it. Fancy intervalometers have many other important and useful features including those described in that aforementioned article. $30: Trigger Trap dongle and free application for iPhone and Android. There is one obvious difference: price. In my opinion the somewhat unreliable cheap Shoot Intervalometer is worth the price as a sacrificial device for use in a harsh environment but not something I would recommend for a critical shoot. It is also a little unfair to compare the two smart phone based products on price alone since they require a smart phone to operate them. Both the Trigger Happy and the Trigger Trap are picky about what phones they support. Neither supports an iPhone 3G – each requires at least an iPhone 3Gs, 4G, 4Gs or 5. That’s unfortunate since I have an old iPhone 3G which I would gladly convert for use only as a camera control device. What I am hinting at is that you may want to consider the cost of an iPhone or Android phone to drive these devices. The Promote Control is the unit I don’t own and its ranking is based on three things: the cost (high), the features (many) and the usability. 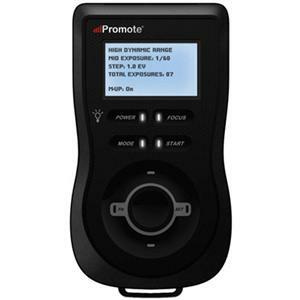 As a dedicated device the Promote Control is almost the most versatile. Indeed it is the only device I investigated that can control the camera – using a USB connection – not just the shutter. But they bill themselves mostly as an HDR device. Watching their videos and following the many modes and button presses made my head hurt. The smart phone based products clearly have a leg up. They can present the data more intelligently and allow more features through upgrade than the few buttons available on the Promote Control. The Promote Control screen is reminiscent of those multi line text pagers of yesteryear. Because it has direct camera control the Promote Control can perform several features that the others on this list can not touch. The Promote can: shoot real extended HDR shots, not only long-exposure HDR. It can also control the focus to do focus stacking. In various modes it can do timelapse, star trail and “bulb ramping”. And it *might* have a method to be dormant for a while and start running the configured program in the future… however it can never be as clever as the Trigger Trap which is able to take advantage of all the other goodies on a smart phone like GPS location, tilt/shift, on board cameras, and WiFi. Being this is a dedicated device, you may not have to worry about choosing between a timelapse and and important phone call. I learned that there is another device like the Promote Control that uses WiFi to allow extended control of the camera through the USB link: the CamRanger ($299). 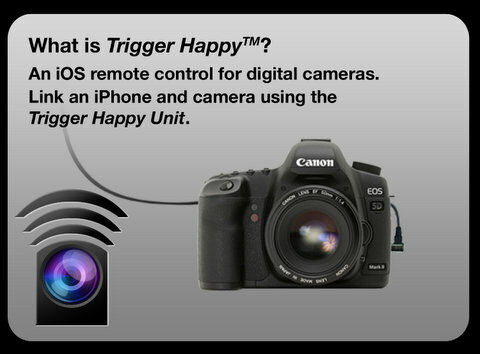 What is enticing about the CamRanger is that it says you don’t need to keep your i-device connected after you set up the shooting program – that would be very nice! If you are a Nikon shooter, there is the curiously named Zesty or ZGR-1 ($70). I downloaded the ZGR-1 app – it looks like a bad hack job – especially the translation of the manaual (as they called it) from Chinese to English. The ZGR-1 app seems pretty limited, too, but it’s hard to tell since it only connects to cameras I don’t have. This device is the newest in my arsenal and is perhaps the most promising. The funny thing is that I was able to test it without having the dongle… because the TriggerTrap and the Trigger Happy dongles both work on the same principle: they attach to the headphone port of your smart phone and control the shutter button by playing sound through that port. If you have an alert, or incoming call, it may make the camera do strange things – I’ve noticed that behavior with the Trigger Happy product, and unfortunately an incoming call during my star trail test with TriggerTrap terminated the current exposure even though I didn’t do anything to the call. Indeed, selecting the home screen on the iPad or iPhone seems to terminate TriggerTrap’s signal – it doesn’t continue to run in the background like the built-in Music Application or White Noise do. gets a wi-fi signal from a master – that is it can become a remote control device. 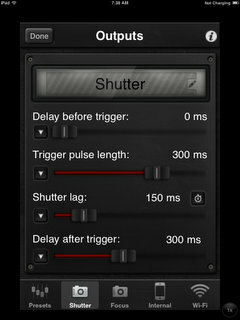 The TriggerTrap application is well done, has copious help, lots of little features, and clear definition of functions. 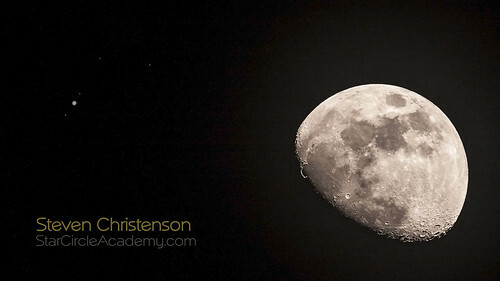 If it lacks anything, it is the ability to save a particular camera or shooting setup. I really appreciate the ability to set times and duration using a slider with a pop-up spin control to fine tune the values that are hard to hit via the sliders alone. And it supports sub-second intervals, timeouts, etc. It also calculates and displays the results of your changes on the fly so if you increase the number of photos that will be taken in timelapse mode, it shows you how many seconds the timelapse movie will last, and automatically calculates the photo interval. It really only lacks ONE very useful feature that I would use… the ability to set an initial delay or an ending time. I’d like to app to “sleep” until 20 minutes before moonset and THEN start my star trail sequence, or set it to end 40 minutes before sunrise, etc. It has the built-in intelligence to know when the sun will rise or set for your current location so it’s just a small matter of code to add the delay function or the cut-off function. Some functions are a little too cute. The Cable Release mode, for example, has an odd little spin-wheel to select functions. A pull down would be easier to use than the mostly useless single letters on the wheel. The area you press to start the exposure is both small and it does not light to show when it is exposing. In the diagram at the left the exposure has been started but nothing is counting down and nothing has changed since pressing the small gray “start” button. One problem with this app, and the Trigger Happy application, is that it must be dedicated to use for the purpose it is intended to serve. I made the mistake of leaving my Bluetooth on and with my car parked nearby my phone paired with the over-visor Bluetooth speaker in my car and could not drive the camera (but I got strange buzzing noises in the car). Turning off Bluetooth solved the problem. BUT a phone call or pressing the home button to return to the main screen effectively ends your exposure. Oh, and the cable is short – about 1.5 feet total – so you’ll need something to hold your iPhone or iPad close to your camera. And the app spills light which may affect your shot. Oh, and an inadvertent touch may stop whatever you’re trying to do. But it does do sub-second delays between exposures. I got mine down to 250 milliseconds between shots without missing any exposures on my Canon 5D Mark II – that’s 1/4 of the time you can do with the run-of-the-mill intervalometer. Indeed, I set my exposures to 26.63 seconds and delays to 250 milliseconds. 45 shots took 20 minutes, 10 seconds which works out to 26.88 seconds per shot. 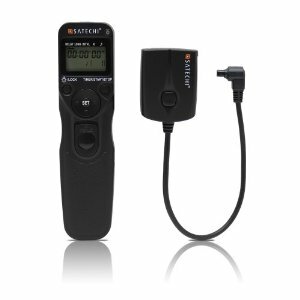 Trigger Happy ranks near the bottom of my list not because it is unreliable, and not because it is more expensive than its TriggerTrap cousin, which it is, and not because many people are reporting months long delays in receiving a working product. No it’s near the bottom because the iOS application (version 1.03) that was released to control it is… maddening. It seems to have features I want (timelapse, Bulb Ramping, HDR Bracketing) but its sophomoric interface feels like it hates me. For one thing, the many screens are all “single purpose” but you MUST select things in the order the app expects or it will both complain AND ignore you. For example, you must start by setting the Interval. If you then try to set a shutter time that is longer than the interval it refuses to let you go ahead – you must go back and change the interval. Moreover when you try to set the Shutter time, it doesn’t TELL you what the current Interval is. A better application would add a “Star Trails” mode where all you do is set the exposure length and it ASSUMES a 1 second or less pause between shots. And a MUCH better application would either adjust or offer to adjust the other parameters for you. A good example of a better application is the TriggerTrap. 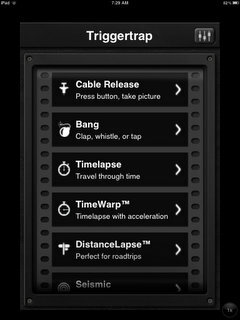 TriggerTrap shows the settings together on the same screen and doesn’t divide them across screens. If you switch e.g. 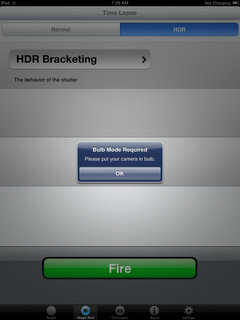 from “Timelapse Normal” to “Timelapse Bramp” it pops up an annoying dialog box “Bulb Mode Required”. Switch the Shutter mode from “Auto” to “Manual” and guess what dialog box pops back up! Blecch. A little on-screen reminder would have been fine, but why pop up a box I can only say “OK” to? Thankfully it has sub-second exposure and interval lengths, but it could be made MUCH better if it asked you what camera you are using and initialized the settings for you… or if you could create a profile for a specific camera. There are many other problems with the interface… for example in “Single Shot” mode the banner across the top on my iPad still reads “Time Lapse” what? A One shot timelapse? The good news is that a release of a better app could dramatically improve the usability and usefulness of this device. I have tried to persuade the makers to do a better job with their application, but the very young adults who started this project long ago on Kickstarter and apparently have had a falling out after collecting $221,000 in starter money. Rather than expend a lot of energy writing about it, you can read my (rather glowing) review of the device on Amazon (its the topped ranked favorable review). One thing to note: the device I received was labeled “Young Nuo” not “Satechi”. This devices is a cheap knock off of the manufacturers device. Like the Satechi, there are different connectors available to fit different cameras. I bought three of them for loaners with my workshop participants and one of them developed the problem I described in the review. (1) Can use WiFi with Master/Slave for remote control. (2) Theoretically all audio jack based controls COULD be operated via a BLUEtooth audio device. 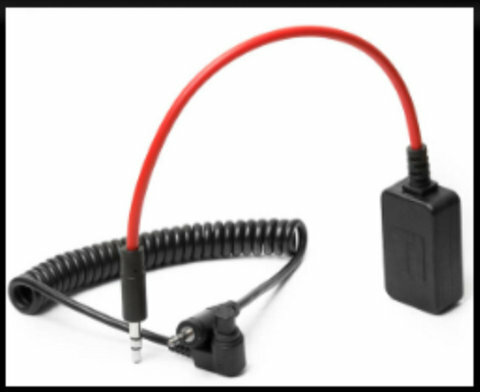 (3) Includes the cost of an application and a cable or cables to connect to the camera. (4) Computer and USB cable required to upgrade the firmware, but not for programming/use. (5) The android application has fewer fancy controls, but the timelapse, bramping, and star trails work fine. (6) My subjective evaluation of ease of use. (7) I ran both the Trigger Trap and the Trigger Happy applications on my older iPhone 4. Each ran for over 4 hours and consumed less than half of my battery – and that was with all phone functions left on (WiFi, Bluetooth, and cellular). Of course your battery life may vary. I did not test the battery life of the Satechi in Wireless mode. CamRanger ($299). Wireless (WiFi) control with USB support. Allows you to view photos like you can with the EyeFi card but you can also control focus, and much more. Timelapse+ ($210) In development – also a Kickstarter Project. Currently only shutter control, but it looks like it may be a serious competitor to the Promote Control with USB support *and* an iPhone application to control it. Rubberband. Yep, rubber band. Set the camera in continuous exposure mode and hold the shutter button down with a rubberband. Works in a pinch – trust me! This entry was posted in Gear, Intervalometer and tagged Android, attachments, Bramp, Bramping, Bulb Ramping, Camera Control, CamRanger, Control, EyeFi, HDR, Homebrew, intervalometer, iOS, iPad, iPhone, Neweer, Remote Cable, Satechi, Shoot, Shutter, smartphone, timelapse, TimelapsePlus, timers, USB, WiFi, wireless on January 21, 2013 by Steven Christenson. hey, nice article. Can you briefly explain what you mean by the different modes? What is the difference between timelapse and startrail modes; HDR and Bulb based HDR? Bulb ramping and bulb base hdr sound like the same thing, are they? How exactly does a remote device control the focus? 1. For “Star Trails” what you want is exposure after exposure after exposure with as little delay between the end of one and the beginning of the next. 2. A “Timelapse” is similar: a uniform exposure time but with a constant (or variable) delay between exposures. 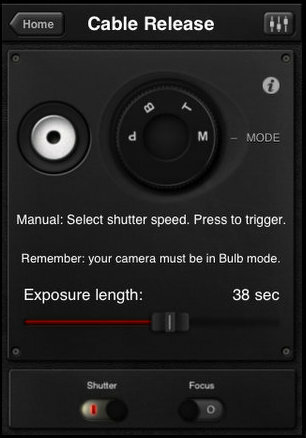 The TriggerTrap has both a Timelapse mode and a TimeWarp mode. The Timewarp mode changes the delay over time and effectively makes the process appear to go faster or slower. 3. Bramping (Bulb Ramping) is another form of Timelapse where the exposure lengths are increased or decreased over time usually to accommodate a rising or setting sun or moon. The change in exposure time may also warp the timelapse, but the purpose is generally to do the holy grail taking a timelapse from say night to sunrise or v.v. 4. Bulb Based HDR means the exposures are all controlled using BULB mode, not by setting an exposure length in-camera. IMHO it’s not really HDR unless you’re shooting at night or with a very dark filter and even then you’re limited. Bulb HDR is NOT the same thing as BulbRamping because HDR exposures are logarithmic while Bramping is linear – or so it seems with every implementation I’ve seen. No shutter based device can “focus” (accept by triggering auto-focus which is highly suspect in dark environments). In tethered mode using USB standard commands can be sent to tweak the focus in or out as you’d do when focus stacking a macro object. You can tweak focus using e.g. the the free Canon EOS Utility – assuming you had a Canon 🙂 Or you can pay money for the CamRanger or Helicon software. That would be a show stopper for me since I use bulb mode + intervalometer almost exclusively for multiple long exposures. Have you run into this issue? Thanks for expanding on your excellent intervalometer article! I noticed it once you pointed it out. But I’m using that very device without any problems. But then, my goal is to keep the interval as SHORT as possible since I mostly do star trails. I used it last night to capture my timelapse sequence of the Moon and Jupiter and set it to a LONG of “0” and a 30 second interval. Of course that’s not “Bulb”, and I’m not even sure if I have the latest Mark II firmware. 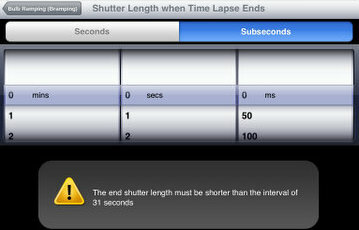 I didn’t realize that the caution refers to the interval between shots, not the length of each exposure. If that’s the case, there’s no issue. I like the flexibility of a wireless system, though the Trigger Trap feature set is far richer. And you’re not breaking the bank in either case. Thanks again, and lovely timelapse! While I have no experience with it, one of it’s neatest features is it’s ability to be able to be controlled via Bluetooth from your iPhone (via an app). Thanks, Brad, I’ll add it to my list. Do you have any experience with this unit? Since it uses the remote/accessory port it means you lose the ability to use the Promote Control with a motorized head because the wireless doesn’t have a pass through, but I can’t think of a scenario where you would use both at the same time anyway. Any number of things could be used to trigger the Promote Control via this port, from sound to light triggers to wet sensors. Oh, and battery life is VERY good. I use Maha PowerEx 2700mAh NiMH batteries and have gone 4 nights in a row taking over 25,000 photos (with the backlight turned off while shooting) without killing them. My camera always dies first. No idea what alkaline performance would be though. I’m not sure how valuable a remote “start” device is unless it has a built in timer to start after a certain delay or clock time (or end at a specific time). It’s kind of like having eject DVD button on the remote control… you’ve gotta go over and lift the thing out anyway. The remote for the CamRanger does allow extended interaction with the camera. But I suppose that wireless thing does allow you to be some distance away. I don’t use the wireless feature on my Satechi very often, either. In fact, almost never. The last time was when I was trying to remotely trigger my camera to take photos of skittish birds. The shutter noise made them more skittish 🙂 One use I *would* put the remote to would be to start a sequence to capture a light painting or fire painting attempt… but I’d want the remote to also be able to stop the sequence. Glad to hear about the robust battery life. Oh, to clarify something though, you can set a delay in hours, minutes, or seconds before a programmed timelapse sequence begins, and you can set the total number of frames it takes before it finishes to better control your start/stop times. I’ve done this and then forgot to disable the auto power off though, and woke up to a very empty memory card the next morning! Oooops! You’re right, it would be nice to have a real time clock on the Promote Control for event triggering. You can disable the auto shut off to use a remote trigger for longer time periods (consuming more battery power, but not bad if the backlight is off). The Promote Control can sit in a camera bag for months without killing the batteries since it doesn’t have a real time clock, but I really wish it did. It would be nice to show an actual time of start/finish for bulb ramping instead of a relative time in the future when setting up a timelapse. I use the wireless trigger when I’m shooting a manual HDR panorama without a motorized head. It’s much more convenient to hold in my hand and step back without wiggling the camera. I’m not sure if there is a bulb feature to manually start and stop an exposure for light painting, I’ve never tried that. I’ve always had a fixed exposure I knew I wanted when light painting. On behalf of the many folks who peruse your blog for valuable information and make no comments, I would like to thank you very much for all of the time and effort you expend in helping others get the very best from their nightscapes. I have benefited greatly from your efforts and I really appreciate it! Thank you, John. Clear skies! Oh, an important point I left off. The TriggerHappy Dongle is a nice long slim cable. Much nicer than the short bulgy coiled TriggerTrap dongle except that it changes the way my Canon 50D or 5D II camera behave. Normally a partial press of my camera shutter with no cable attached starts the camera metering, confirms focus, and engages the image stabilization (if IS is turned on). A further press will snap a shot. With TriggerHappy plugged in a partial press of my shutter does all that AND fires a shot. So if I just want to check the in camera metering I have to remove the cable. The TriggerTrap dongle doesn’t behave like that. Looks like another entrant in the remote control space – a CamRanger competitor is “Cameramator. Not sure the name is so great and at the moment it looks like the interface is a bit less featured than CamRanger – but the price is the same. Cameramator, however, is not shipping until March, 2013?. It is also a Kickstarter project, but looks to be in better shape than TriggerHappy. Wait, I take that back. It looks like it got really messy with yet another company taking over sale/distribution/development: iUSBportCamera. Received my CamRanger a few days ago… am evaluating it. First impressions are that it does what it says, BUT, there are no sub-second timing options (inter shot intevals) and the Intervalometer function gives no indication that it’s running and doesn’t seem to be stoppable. You also can’t use the app at all unless the CamRanger is powered on and connected to the camera. Thus you can’t configure the Intervalometer until you’ve done all those things. Lastly, it doesn’t seem to have a delay before start function. Of course all of this is based on the iPad and iPhone software which can be changed to remedy these types of issues. Re Triggertrap. Disclaimer – I’m not part of the cult, I use Samsung Galaxy III. Caveat emptor for Android users. They have valid reasons for coming out with an apple version first and according to Haje Jan Kamps if you are an Android you now need Dongle V2 which can be identified by its red cable. – It has a slimline plug so it is easier to use with a case on your smartphone. 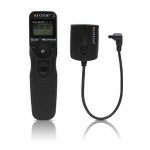 -Triggertrap no longer sells the Triggertrap Dongle 1 themselves, but some distributors still have a few in stock. With the black cable Triggertrap did not work with my D700. Just for grins I hooked it up with my wife’s iphone 4 and it worked fine – and was fun to use. It was then I discovered that apparently it’s fastest shutter speed is around 1/60 of a second, about 4 stops short of what I was trying to do. Will keep testing. Thanks, for the feedback, Mike. As you pointed out, the old dongle doesn’t work as well in Europe where the iPhones are volume limited. Apparently that’s what the Galaxy problem is. And I thought you were a hard-rock ear-bleed headbanger! Instructions for turning off the volume limiter are here on the TriggerTrap site. Don’t know how you do it (or if you can, on a Galaxy) but I do see mention of a “PowerAMP” application that may allow greater volume through the headset. The bad thing is that right now is a beta feature and doesn’t work very well. The feature set of the Timelapse+ is underwhelming compared to that of the CamRanger but it has most of the guts it needs and it is currently about half the price. Have you tried the Magic Lantern firmware? It has a bulb timer, intervalmeter, bulb ramping, as well as a bunch of other features. I used it last weekend for star trails and it worked perfectly. Of course, it was my first attempt, so I have no other devices to compare it to. Hoping it will continue to function well, but if there are any known issues I would definitely rather pick up another device than risk failed evening of shooting. I recently had a Shoot Intervalometer fail which was less than 6 months old. I also own a Yongnuo that looks basically identical that is over 3 years old, and still works perfectly. Fortunately, I also had a CamRanger with me so I still was able to use both cameras. I was curious as to why the Shoot failed, so I disassembled it. The Shoot is manufactured by Aputure (that is the way it is spelled!). I also disassembled the Yongnuo. The internal build quality, materials, fit, attention to detail and finish of the Yongnuo are much better than the Shoot. The Shoot circuit board is crudely designed and has many parts. The Yongnuo board is clean with minimal parts and utilizes ICs. I paid $13 for the Shoot and $28 for the Yongnuo. I recently bought another Yongnuo Intervalometer from HK and received it in about a week. It arrived with good documentation and the build quality is excellent. My recommendation is for a few dollars more to go with the Yongnuo. Thanks for the thorough analysis. I’m sure our readers will appreciate that. Great device! I built one and it is working great.